Since Magento Enterprise Edition version 1.14.1, a visual merchandising tool has shipped right out of the box that lets you display and promote your products to best encourage customer purchases. Magento 2 Enterprise Edition now ships with the Visual Merchandiser as part of the Magento framework. No longer a third-party extension with a different namespace, it also includes much-needed improvements to the Visual Merchandiser workflow. For one, pop-ups are gone. Also, Smart Categories are now referred to as Category Rules, which seems to better fit Magento’s rule terminology, e.g., Catalog Price Rule, Related Products Rules, and Cart Price Rules. You can also set up the Visual Merchandiser’s category options separately for each store view. The options determine the selection of products, their relative position in the list, and the attributes available for use with category rules. Prior to Magento Enterprise Edition 1.14.1, you had to use basic position numbering to change the sort order of products within a category, unless you used a third-party extension to assist with visual merchandising. The manual process of position numbering can be quite tedious, especially with a category containing a large number of products. This is where the Visual Merchandiser becomes an essential tool for merchants. You can manually position products by drag and drop or automatically position them by availability, price, name, SKU number, and more. 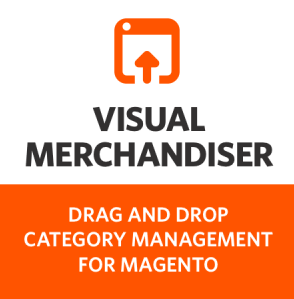 This screenshot from Magento’s website shows a few of the Visual Merchandiser’s sort options. There are two methods for sorting category products: manual and automatic. With automatic sorting, you override the current sort order and reset any drag-and-drop positions you had set manually. Only products matched by the rule will remain in the category. Any unmatched products and manual sorting will be removed after saving the category. You have the option to work in visual mode, which shows each product as an item in a list or tile in a grid. You can use the buttons in the upper-right corner to toggle between display modes, with the same tools available in each mode. Category product rules let you dynamically change a product selection according to a set of custom conditions. For example, you can create a category that automatically includes all discounted clothing. Or, you can create categories for certain brands where adding a product to the catalog causes the product to automatically appear in the corresponding brand category. Another Magento.com screenshot shows how you can create product lists using custom conditions. Each category can have only one category rule; however, a single rule can have multiple conditions. Each condition will consist of a product attribute, value, and logical operator. Only attributes with the Use in Product Listing property set to Yes are available for use in category rules. These conditions speed the process of assigning products to categories. As you can see, the Visual Merchandiser greatly simplifies your job as a store merchandiser, saves you valuable time, and allows you to focus on new revenue-generating verticals. Blake Bauman is a technical architect on the LYONSCG Implementation team, and has been building Magento sites since 2009. Besides eCommerce and technology, Blake enjoys traveling, the outdoors, on and off road cycling, and spending time with family and friends.